Olfrid Battle-Born is a Nord warrior who is widely known in Whiterun as head of the Battle-Born Clan. He and his family are known to harbor animosity for the rival clan in the city, the Gray-Manes, as well as being staunch supporters of the Empire. Aside from feuding with the Gray-Manes, Olfrid is also known to be an important client to the Thieves Guild, which after helping him save a friend, he helps to spread influence of the guild to Whiterun. 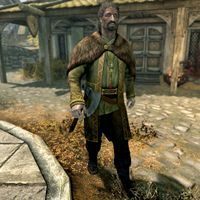 If Whiterun falls to the Stormcloaks, Olfrid, if you ask, bitterly complains that he and his family are subject to persecution for their Imperial sympathies in the form of robberies, which he suspects to be the work of the Gray-Mane patriarch and new Jarl of Whiterun, Vignar Gray-Mane. Like his son Idolaf, Olfrid will also wish out loud that the Empire will send reinforcements to retake the city. Olfrid wears a set of fine clothes and a pair of fine boots, and is equipped with an iron war axe. He carries a key to the clan's house, and a selection of common loot and gold. When you approach him, Olfrid will quickly show his pride in his family name: "Olfrid, patron of the great Clan Battle-Born, a name I'm sure you know well." He will then quickly begin to give you his opinion on the Gray-Manes: "I'm as much a Nord as the next man, but I'm no fool. I don't live in the past, like those Gray-Manes." He will elaborate on this subject, talking about a former friend who is part of Clan Gray-Mane, Eorlund: "Eorlund Gray-Mane's a stubborn fool. Our friendship ended when he turned his back on the Emperor." If Eorlund is no longer alive, he will instead say: "Eorlund Gray-Mane was a stubborn fool. Our friendship ended when he turned his back on the Emperor. Now he's dead." He may also provide you with another reason as to why he feels the Battle-Borns are a stronger clan than the Gray-Manes: "Clan Battle-Born's got a proud lineage in Whiterun, but unlike the Gray-Manes, we've also got wealth." He may also tell you about his son, Idolaf: "My bloodin' days might be over, but my son Idolaf is out there fightin' for Skyrim! Fightin' for the Empire! Ha!" If you ask Olfrid why there's a feud with Clan Gray-Mane, he will provide you with his opinion on the one item that has created tensions between the two clans: "Money, you laggard! What else? It always comes down to coin. The Gray-Manes have deep roots in Whiterun, but so do we. Difference is, we're rich, and Vignar hates it. Oh, and they hate it, too. All their big talk of pride and honor, and what have they got to show for it? Beggar's rags and stale bread. We've got the same pride, the same honor, and we've got wealth. No wonder they envy us." If you ask him to tell you about Clan Battle-Born, he will gladly tell you about the legacy of the clan: "Battle-Born is a name out of legend, sung in the songs of old and heard in deeds of valor for a hundred generations. 'For Clan Battle-Born!' they cry in the mead halls. 'First into the fray and last to quit their ale!' We've got honor. Wealth and titles, too. Aye, and buxom women to warm your bed on a cold Skyrim night. Now if that don't answer your question, then no words will." This page was last modified on 8 March 2016, at 14:50.